CROSBY  Commissioner Jack Morman spoke here last week and informed the local business population about new roads to be resurfaced, new roads to be built and spraying against mosquitoes. The commissioners discussion of infrastructure was interupted 5 times by applause at the Crosby-Huffman Chamber of Commerce luncheon last Thursday. Morman became the Commissioner for Crosby after the redistricting was announced on March 31 and he will probably be the County Commissioner for Huffman after November once the current lawsuit is settle over redistricting. There are two infrastructure projects that Commissioner Morman started in the last 30 days within the Crosby/Newport area. Widening of S. Diamondhead. Generated from the response of the Newport HOA meeting  Pct.2 will move forward with engineering tasks to improve S. Diamondhead from Cape Hope to FM 2100. Commissioner Morman has already met with Harris County Engineering Dept. to begin preliminary design. It is the precincts intent to bid this project the first quarter of 2013. The estimated project cost is $2 million. That $2 M. was about the amount awarded to Precinct 2 by Commissions Court for the equipment that went to Precinct 4 with the new extended land area that Precinct 2 will absorb probably after November from the Redistricting Texas legislation and court rulings. 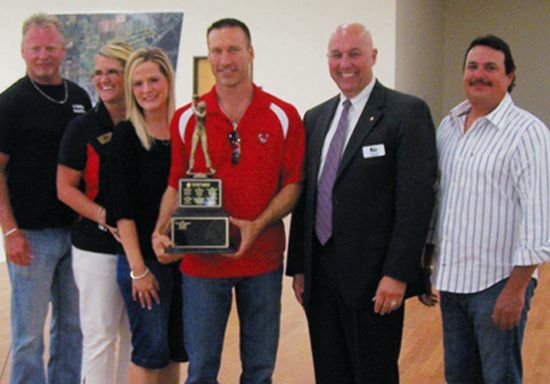 CROSBY  The Crosby-Huffman Chamber of Commerce again had a successful fundraiers for their operations that include staff and general operations in support of the community last Friday, April 13. The event was lucky for most participants in that they had excellent playing weather. A community dinner followed contributed by Crawfish Shack featured Crawfish with a Cajun flavor and shrimp with corn and red potatos. ACE Sponsor was United Community Credit Union. This year the event was termed Tees and Tails. Longest Drive was made by Casey Nickell  Crawfish Shack. Closest to the Pin was Alvin Cormier of Madison Benefits. The Community Dinner with Live Auction performed by Bill Busby put the fundraiser over the top and will enable the Chamber to proved service to the Community. LA PORTE, TX – Booming cannons, cracking musket fire, thundering hooves and battle cries will resound across the San Jacinto Battleground, 3523 Battleground Road, LaPorte TX 77571, on Saturday, April 21, as hundreds of history reenactors recreate the events leading up to Texas winning its independence at the decisive Battle of San Jacinto. This dramatic battle reenactment is the centerpiece of the admission-free San Jacinto Day Festival, held on Saturday, April 21, 2012 from 10 a.m. to 6 p.m. on the grounds surrounding the San Jacinto Monument. Highlights of the Festival include family entertainment, living history demonstrations, a childrens area and vendors reflecting all things Texas. 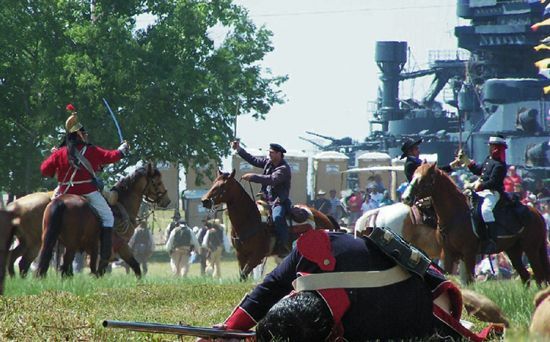 The largest battle reenactment in the state celebrates the 1836 Battle of San Jacinto, and its the most popular event of the day, it begins at 3 p.m. Presented by hundreds of members of the San Jacinto Volunteers and other living history organizations from across the state, the reenactment dramatizes the decisive battle where General Sam Houston led his Texian soldiers to victory over the Mexican Army eventually leading to almost one million square miles of Mexican territory becoming a part of the United States. The reenactors will dramatically interpret the Runaway Scrape (Texians fleeing from the advancing forces of Santa Anna), the cannon duel and the final battle between the two forces. New this year: Solero Flamenco presents a fiery, passionate and virtuoso flemenco performance, let by founders Irma La Paloma and Jeremias Garcia. New this year: The Coleman Brothers: The Coleman brothers are true road warriors from Texas who have toured with Willie Nelson, Ray Price and many other Texas legends. They had two #1 independent hits last year with Beer Thirty and Down by the Fishin Hole, and are known for their pure true-to-life country music and trademark layerd vocals. New this year: J. R. Ancira: J. R. Ancira is a solo acoustic, singer/songwriter that specializes in country, with a variety of cover songs plus his own originals. J.R. has been singing and playing guitar for the past 20 years and has a one-of-a-kind voice. Dr. Jesús F. de la Teja – the former State Historian of Texas, and presently the Distinguished Professor of History at Texas State Univ. and a board member of the San Jacinto Museum – will present a talk on Antonioo Menchaca and Santa Anna: An Unlikely Encounter at 12:30 and 1:30 in the Monuments theatre. Menchaca is one of the Tejano heroes of San Jacinto who had an encounter with Santa Anna following the generals capture the day after the battle. Visitors can wander freely among the Mexican and Texian camps of the reenactors to learn what the soldiers of that day were doing prior to the battle in 1836. Texas Parks & Wildlife Department will offer archery classes for young people. Monument visitors can take the famous 489-foot elevator ride to the top of the Monument; enjoy the digital presentation Texas Forever!! The Battle of San Jacinto; and view the museums latest exhibit Making a Mark, Leaving a Legacy. Combo tickets for the elevator ride, the exhibit and movie can be purchased for $12 for adults, $10.50 for seniors, $8 for children. Do not take the ferry on I-10; because there is only one ferry working right now, the wait is long. Visitors are encouraged to bring lawn chairs and/or blankets for comfortable viewing of the battle reenactment. For more information please call 281.479.2421 or visit www.sanjacinto-museum.org. 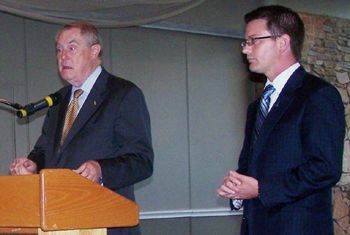 CROSBY  Harris County Precinct 2 Commissioner Jack Morman and Rep. Wayne Smith, R, District 128 Texas Legislature addressed the Newport Property Owners Association on April 12 and discussed roadway improvements for South Diamondhead in Newport and resurfacing in Crosby. On March 29, the courts determined that District 127 had too many people and Dan Huberty had to give Crosby to Smith and Huberty retained most of Huffman, and west through Humble. Smith a Vietnam Veteran has been given the Outstanding Public Servant award by the Texas Association of Businessmen and is named a Conservative Leader by the Heritage Alliance. Jack Morman, R, gained the largest land area of Harris County for his Precinct 2 in redistricting. But Precinct 4 now condensed in acreage and expanded in per capita income retained all the mowing and other service equipment it held under Jerry Eversole. Morman now controls 380 employees, 50 parks, 11 community centers and 1050 miles of county road. There are two infrastructure projects that Commissioner Morman has initiated in the last 30 days within the Crosby/Newport area. 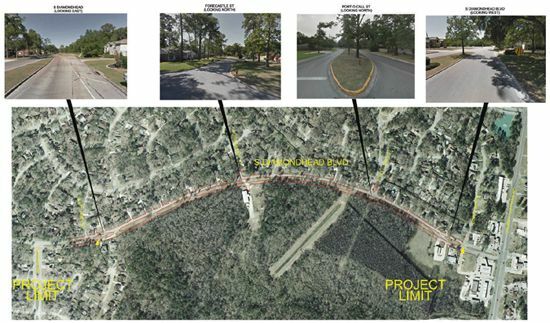 Newport: Widening of S. Diamondhead: Generated from the response of the Property Owners meeting  Pct.2 will move forward with engineering tasks to improve S. Diamondhead from Cape Hope to FM 2100. Commissioner Morman has already met with Harris County Engineering Dept. to begin preliminary design. BetterStreets2Neighborhood is the base repair and resurfacing of asphalt street in the Crosby, Nelson Subdivision, Jackson Bayou Community and outlining areas. This project is already in design and will start construction mid-summer to be complete in 45-60 days. The estimated project cost is $2 million. Maps of the street locations will be available at the Chamber of Commerce luncheon Thursday. Mowing in Crosby has already begun with complete mobilization of 8 mowing crews starting in May. Commissioner Morman spoke directly to each question asked about managing streets and improvements. His challenge for the future will be to purchase the right of way for the proposed widening of FM 2100 from Crosby to Huffman to give to the TXDoT to build the highway. Smith although stating flatly that he was at the meeting to hear questions from the audience explained some of the functions of the State Legislature. Smith spoke of the proposed widening of FM 2100 from Crosby to Huffman as on the charts to begin within the next three years. He is awaiting TXDoT to inform him of when the proposed exit off of U.S. 90 Westbound to FM 2100 will be completed. He asked to be informed of guardrail problems by the public. CROSBY  This Saturday April 21, according to the construction supervisor of the overpass at FM 2100, through lanes will be narrowed to one lane in each direction. The upcoming bottleneck is sure to slow traffic as the new roadway for FM 2100 is being built. The website: www.visitcrosby.com promises to keep web saavy commuters up on changes to the surface street conditions. Two sections are to undergo changes as construction of new roadways begin in earnest to complete the proposed overpass and roadway improvements including softening the curve near the Chevron Station North to South Diamondhead. A section of South Diamondhead before FM 2100 is to undergo widening. This Saturday it will narrow to one lane as it will receive State construction from the first turn out to FM 2100 and continue as one lane in both directions all the way up onto Edna Road. This Saturday from the traffic light at Wahl Street all the way to the curve on the other side of the FM 2100 roadway from the beginning of First Street the roadway will narrow to one lane in each direction. Traffic is expected to remain in this configuration for several months. It is expected to be finished by Summer. At that time a new frontage roadway, currently under construction that is to become ultimately the northbound lanes, is expected to have been completed. Final completion of the overpass project is expected to be in the Summer of 2013. 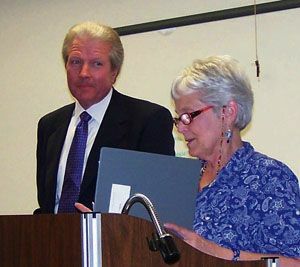 CROSBY  Justice of the Peace in Precinct 3 Position 2 Don Coffee spoke to the Friends of the Crosby Library about the role of the library in modern times and got into explaining what he does for a living. After a single question he lead into the problems facing todays youths and problems with the schools and judicial systems in their efforts to handle those problems. Coffee will not be hearing the case of 5 Crosby youths that are facing a class 2 felony for Criminal mischief but is familiar with the conditions and the questions of how to administer justice when youths are involved. All this came on Monday when the names and charges against five area youths were released that had flattened the tires on 58 buses with bolt snips. Cody Wagone, Nicholas Soza, Javone Garcia, Cecil Fontenot and Nelson Rodriguezhave been charged as adults with criminal mischief for damaging the buses. Sgt. Rick Miranda and Deputy Chris Harrison of Precinct 3 Constable Ken Jones Office put in 22 hours investigating the case. My first goal is to improve their reading levels because reading is elemental to everything. Coffee explained. Those five kids that thought it was going to be a cute stunt to cut the valve stems off those buses are facing state jail felony charges and one has seemingly lost a scholarship. Kids make bad choices, it is one of the things that marks being kids. The system in place called zero tolerance seems to dictate that if they make a bad decision their life is ruined. It isnt our fault there is zero tolerance. But ours is a court of equity, we do not keep transcripts my decision is what we follow so I have some space to rule, if they dont like my ruling they can appeal but they will start all over again. he explained. So if someone begins life with a second degree felony does it correct them or does it, ruin their life as Coffee stated? I think their will be some common sense applied at some point, I think right now we are at the shock and awe stage where we are trying to scare some sense of how serious the act was to others. I think it will be bigger than a Class C and they will probably face Criminal Mischief with a record and they will be put on probation and maybe that one kid will not lose his scholarship. But right now it is a dollars and sense thing. I think the cost was about $1900 for the tires and other costs I am not aware of now. But we all know that when we are kids some pretty egregious things happen but no one went to jail. Nobodys lives were ruined but truly we have gotten into this mode of zero tolerance. There were all kinds of reasons for it but I think that at some point we have to rethink extreme enforcement. stated Coffee. On Sept. 1 with the help of Senator John Whitmire we established legislation that each school have a truancy prevention program asking why students are absent. Coffee stated. CROSBY  It is said that the measure of an administrator is how well they respond to a crisis; well, measure Superintendent Dr. Keith Moore by Monday, April 2 beginning at about 6:00 a.m. when he first learned that Crosby ISD buses had been damaged in a district that transports about half of their students to school. 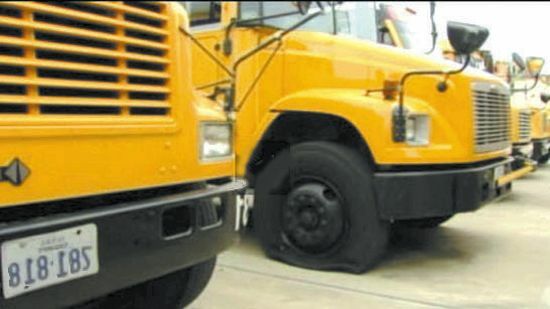 Sometime on April Fools Day and Palm Sunday vandals cut their way into Crosby ISDs bus lot with bolt snips and then went to work on tire stems and hoses on 58 of 70 buses. Superintendent Keith Moore says the Houston ISD helped provide valve stem replacements so the buses could run their regular routes later Monday. He was very grateful for the cooperation of law enforcement, Houston ISD, the Maintenance Dept., the Transportation Dept. and the community in general. By 11:00 a.m. all buses were running for the late morning rounds, a remarkable recovery. According to Captain John Moore of Precinct 3 Constable Ken Jones Office, investigators began receiving information as soon as Dr. Keith Moore began to spread the word that his buses had been vandalized, he was looking for information on who might have done it, parents were asked to bring their students to school. By Tuesday 6 persons of interest were being questioned related to the break in and damage incident. That afternoon five 17 year olds or older Seniors from the local high school were being detained based on their statements. The same names were mentioned numerous times by those with which we spoke. said the Precinct Captain. Word gets around pretty quick. commented Dr. Moore. The high school was asked for information on Monday at a special meeting in the Crosby High School Gym. 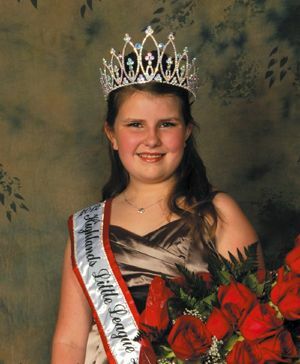 According to one parent, students were concerned that the Senior Prom would be cancelled. Concerning the cost to the school district Dr. Moore says that the valve stems cost about $5.00 each but the labor for 3/4 of a day for everyone concerned is substantial. There are about 5,050 students in Crosby ISD some 2500 were inconvenienced by the incident.